The powder coat paint preparation process typically involves a series of cleaning, rinses and chemical treatments to completely clean and etch/coat the material surface to allow for maximum powder coat paint adhesion. Depending on part size and production volume rates, many different types of equipment can be used for preparing parts for powder coat painting. From manual cleaning / prep spray booth, turntables to fully automated monorail powder coat prep systems, Best Technology offers a full selection of powder coat prep equipment. 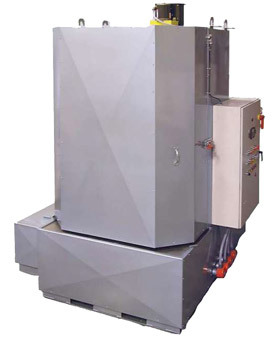 A wash booth / pressure spray pad is the most common powder coat machine for small volume or large parts which vary greatly in size. The floor is made of grated / perforated steel / stainless steel to allow for solution to drain through. The floor beneath the spray booth walls has perforations that are pitched center to drain to allow for easy clean out of solution and dispose via waste water treatment. Another configuration of the spray booth powder coating would recycle the solution via high pressure sprayer hooked up to the drain and solution reservoir. 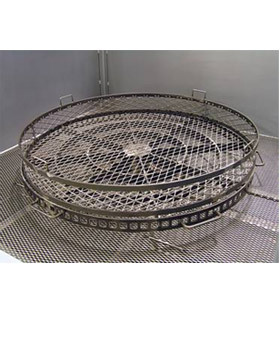 Parts similar in size / configuration can be placed on a rotating turntable spray booth and can be sprayed with wash, rinse, phosphating, etc solution. The part can be easily rotated for uniform, complete coverage of solution. The turntable of the pressure washer spray wash booth is perforated to allow for complete solution flow and collection into the bottom solution reservoir. Like the wash booth / pressure spray pad mentioned above, the bottom is pitched to drain to allow for easy solution disposal or recycling via spray pressure washer. 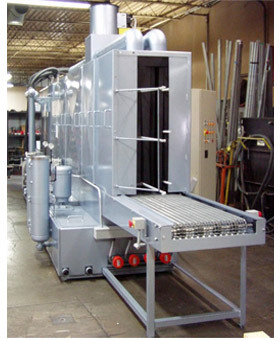 Increased production levels require automated spray powder coating booth preparation systems that automatically wash, rinse, phosphate coat, rinse and dry (or any combination) parts all in one piece of small, enclosed pressure spray power coat equipment. Multiple solution storage tanks all for recycling of wash, rinse and phosphating acid. 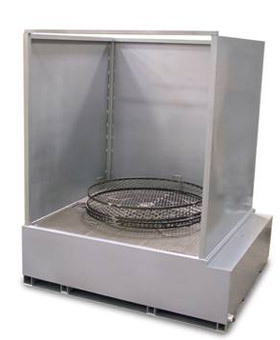 A multistage immersion powder coat spray booth parts washer can also be used for powder coat prep cleaning, alodining and phosphating applications. High production rate applications require inline, monorail or conveyorized washing, rinsing, phosphating, etc powder coat equipment systems. These systems are built to accommodate a wide variety of part sizes and have been built up to 300 ft. long.